HEIGHT 190 cm / 6'3"
PLAYS Jesper is impressively calm in the goal and he brings confidence to the whole team by just entering the ice. He has the ability to win games on his own and can completely take over games. Jesper is a dynamic butterfly style goalie with an exceptional technique and eye for the game. He is also a great skater that enables him to get in the right position quickly and to get the upper hand on shooters. Jesper after scoring a goal and an assist in the same game as the youngest player ever to do so in the Swedish U20 league. Jesper was born November 14th 2002 in Västerås, a small town just outside of Stockholm. He was introduced to skating very early in his life as he started skating with the local bandy team in Västerås. However, he started to play hockey instead due to the lack of competition in bandy. 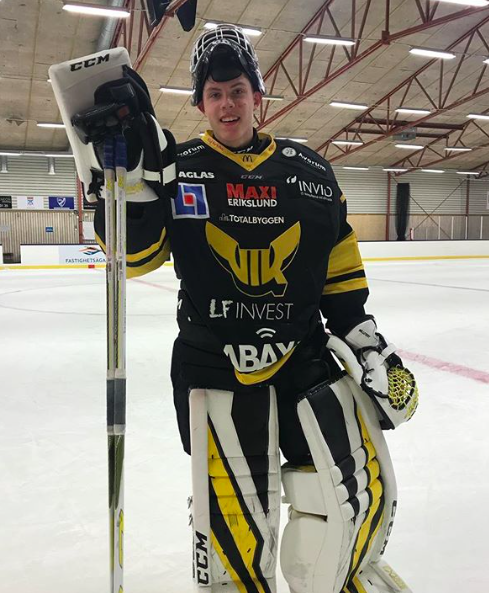 The decision to become a goalie was an easy one as Jesper's father was a hockey goalie as well and his eight year older brother is currently a goalie in NCAA college league in the United States of America. The 17/18 season was Jespers breakthrough year. For instance, he succeeded several records in the Swedish U20 league and surpassed Victor Hedman by being the youngest player ever to play in the league. Jesper also became the youngest player to ever score a goal, which is truly remarkable considering he is a goalie. Jesper represented the Swedish national team for U16, U17 and U18. Jesper recently moved from his hometown Västerås to Luleå where he will continue his junior career.